Who Are Wars and Sawa? Long time ago, when the Polish countryside was still wild and beautiful, there was a small village on the banks of the Wisła river, inhabited by kind people, who spent all their days occupied with fishing. One evening, when Wars was collecting his web and fish before going home to retire, he heard a quiet song coming from old willows, the branches of which washed in the river. He sat again and listened. It was a beautiful song. Mysthical. As if not sang by a human being. Wars could not understand the lyrics, but he sensed it was a song about wildness, life, and the beauty of nature. He was mesmerised. So much that he forgot about the world around him. The next evening, when his work was accomplished, Wars sat at the bank of the river and waited. Suddenly he heard that song. Nearer than the day before. And more beautiful. So beautiful that he had to stand up and go there. Closer to the sound. He must see the owner of the silver voice. He did not know where he was or how found himself there. Or even what time it was. But finally he saw the singer. It was the most beautiful lady in the world. She had long golden hair, and skin as white as snow. It shined in the moonlight, as did her… fish tail. When he saw that tail, his first thought was to RUN! But the second one told him to stay. Unfortunately she heard the rustle of leaves, and disappeared beneath the water. Wars waited for her every evening, hoping she would come back, but she did not. She must have thought him dangerous. After several years, when Wars lost all hope and almost forgot his eerie adventure, his ears were reached by the almost forgotten sound. He took his web and hurried to the spot where the song came from. Once more he saw the most beautiful woman in the world. This time he was prepared for her appearance, so he did not move when she exposed her silver tail. At a convinient moment he caught her into his web. She screamed and cried, trying to escape, but she could not. Wars took her to his house and began to wonder why actually he caught her. What told him to do that? Wars could not stand her tears anymore. He took her to the river and let her go. “Sawa,” she answered and disappeared in the waters of the Wisła river. From that day on Sawa sang to Wars and his children, and then their children. And defended them from any danger. Today there is the city of Warsaw in that place, named after the two lovers: WarsSawa. 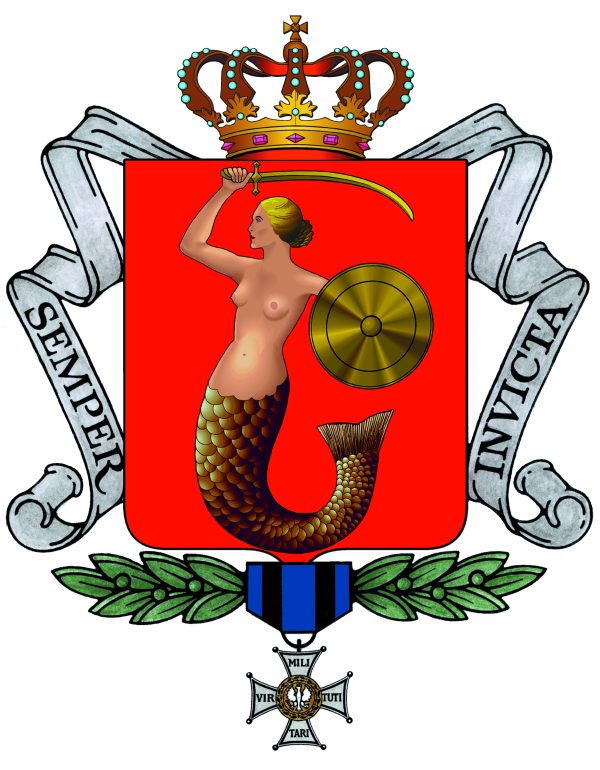 The city’s coat of arms features a siren with a shield and sword. 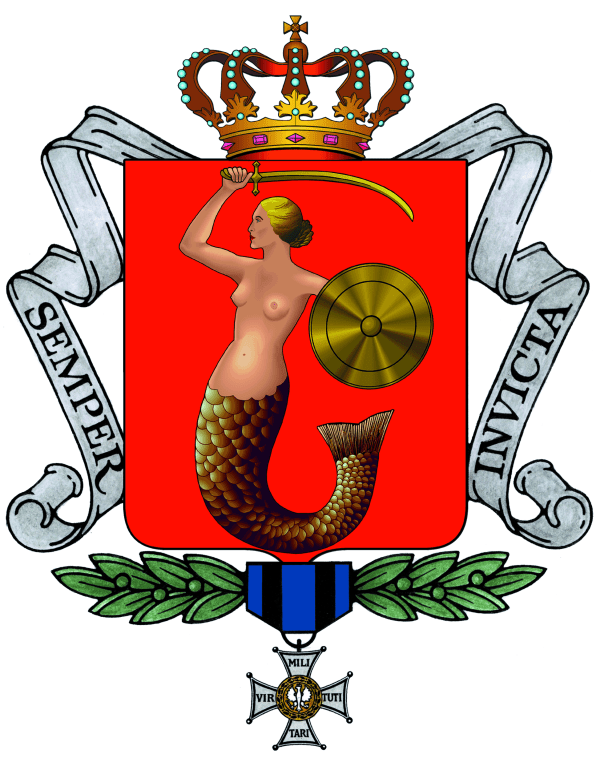 Warsaw’s coat of arms includes the order Virtuti Militari, awarded to the city after WWII to honour the bravery of its citizens, and the motto Semper invicta (Always invincible). For a different and funnier version of the legend, written with expats in mind, go to Warsaw-life.com.